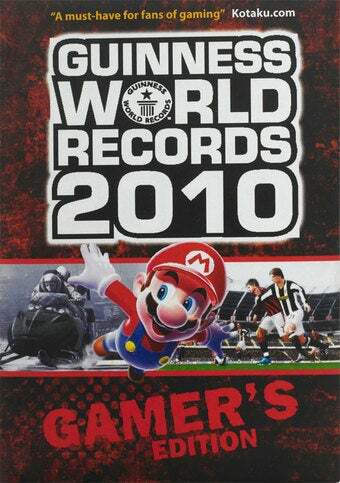 Would You Like To Know Some Guinness-Certified Gaming World Records? Waiting for me in the office upon my return from vacation this week was a copy of the Guinness World Records 2010 Gamer's Edition. So many records in there. So let's randomly highlight a few feats. Ah, but let's have some fun with this. The book's about 200 pages long. So, write a page number in the comments section and, if there's a world record listed on it, I'll tell you the record. OK. On that page, we learn: "With 24.84 million copies sold, Halo is the best-selling first-person shooter franchise ever." Huh. Guess it trumps Doom. The first 10 people to drop a page number in the comments will be told Guinness World Records. By me. UPDATE: Scroll down (and click to reveal) all the comments below and you'll see I've provided 10 records to 10 readers. Please refrain from further requests. I'm off to other ridiculous endeavors. It's like we're writing a post together, a verifiable nominee for Most Reader-Friendly Gaming Blog Post Of All Ever.